This is, in my opinion, a MUST SEE opportunity especially if you have kids. 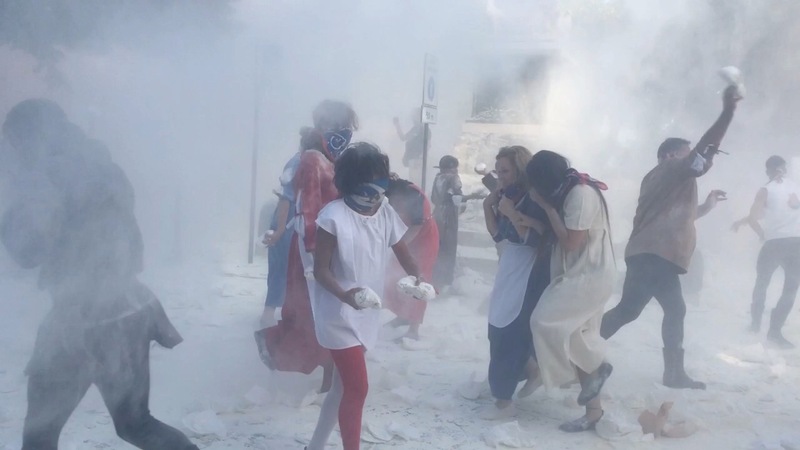 Canons, horses, oxen, and a FLOUR FIGHT!! All that and then an archery competition. Città della Pieve is a charming hilltop town in Umbria with around 8000 inhabitants. Like many similar towns it is divided into three districts or ‘Terzieri ‘ each one with its own flag and costumes and bands. This division began way back in medieval times and was then class based. In the case of Città della Pieve an eagle represents the three different districts or classes. The head of the eagle being Terziere Castello and the knights. The Aristocracy. The stomach of the eagle being Terziere Borgo Dentro and the people living within the castle walls. The middle class..
I’ve seen this Festival more times than I can remember and never tire of it! The last day (Sunday) of the Festival is great fun. Kids will love it! The activities start around 5pm with a costume parade which sounds boring but definitely is not! The different districts don’t just dress up in their medieval costumes. They also parade the trades of their medieval ancestry. 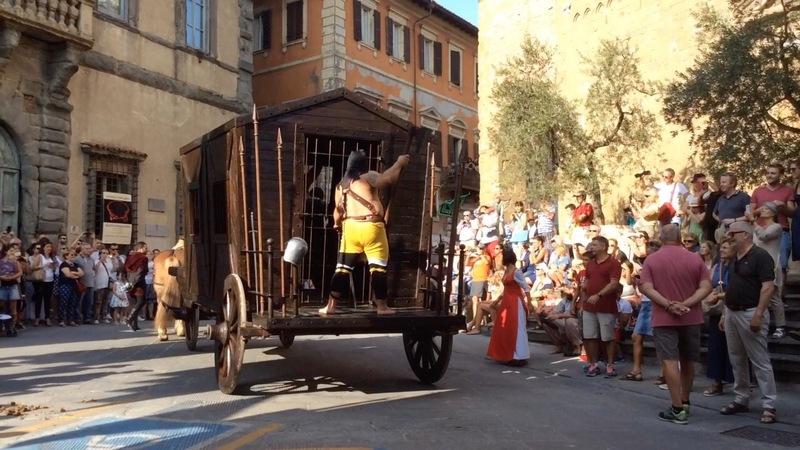 Anything from giant canons shooting footballs into the crowd to oxen and donkeys and even a prisoner in a very sinister looking contraption. All this is accompanied by brilliant bands and drummers and very enthusiastic cheering wenches! I like to arrive early afternoon and then wander around the different districts of the town. Often the pre-parade preparations are as much fun as the parade itself. Palio dei Terzieri. Borgo Dentro. At the end of the parade there is a huge flour fight which the audience can participate in if desired but do bring along protection for eyes and nose! Then, as if that wasn’t sufficient everyone gathers on a field for the real Palio which takes the form of an archery competition. Plus lots of speeches and music and drumming!